Not every project takes the same trajectory, but I find I travel through similar steps when seeing a design through to fruition. 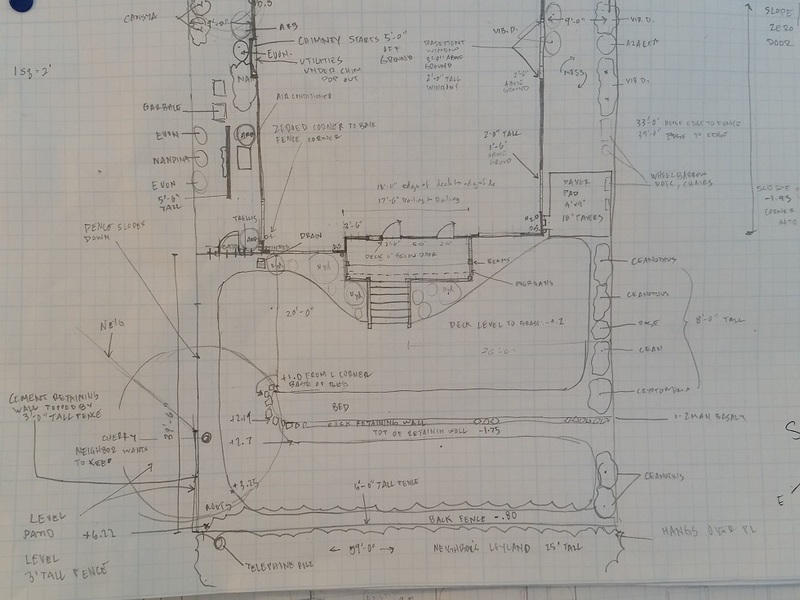 Here’s a brief outline of the the design process. I always have an on site meeting with a client, before beginning, to discuss the questionnaire they’ve filled out prior to my arrival. This gives us a chance to walk the garden, discuss likes and dislikes and dreams for how they want to use and feel in their future space. I look at the style of the architecture, the style of the throw pillows on the couch (yes, really), I check views from the inside of the house out … This is a fun meeting where the creative juices always get flowing. 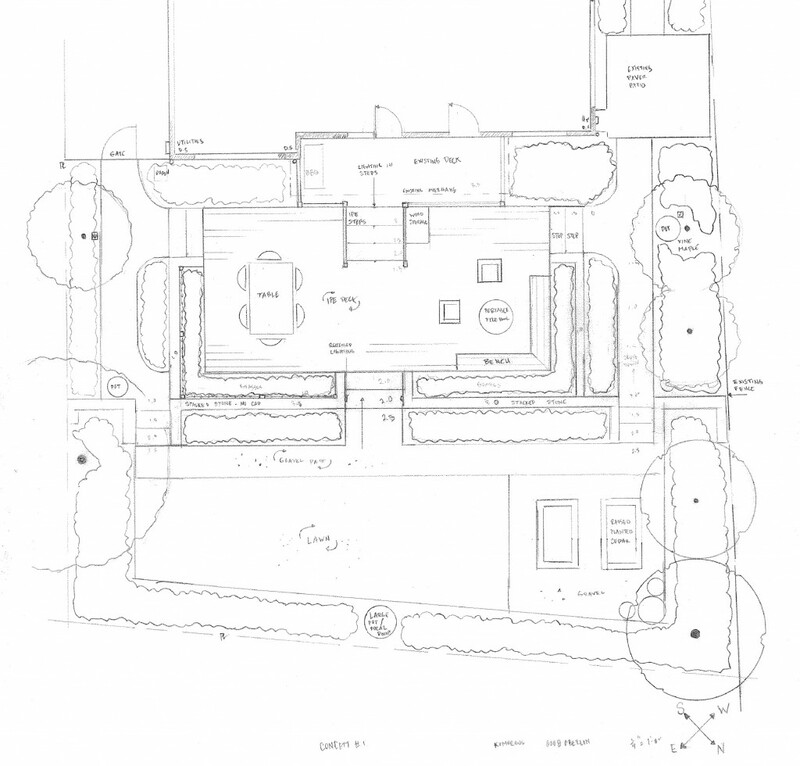 A view from the existing lawn to the existing back door and deck. 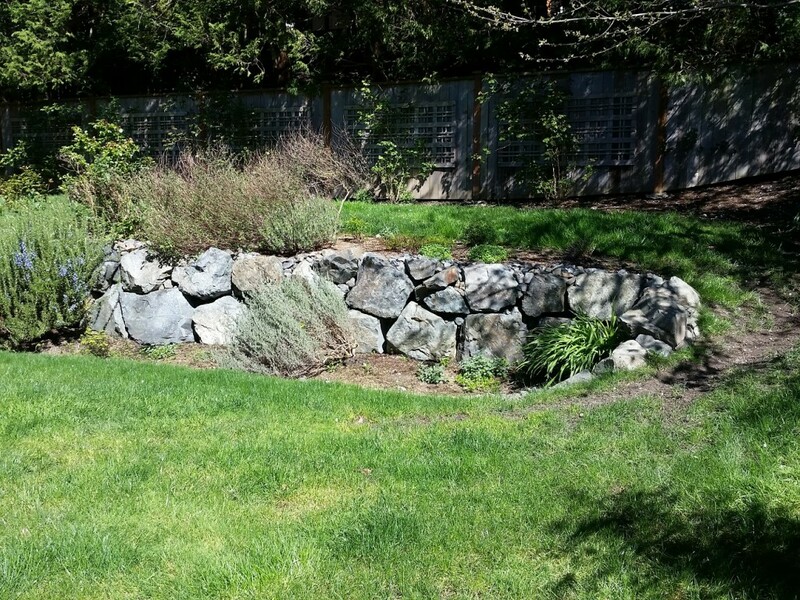 A view from the existing back deck to the lawn area above a rock retaining wall. The site is awkwardly split in half. Next, I set an appointment to come back for site measurements and site analysis. This is the down and dirty phase. I literally crawl through bushes with my measuring tape and zip level. My measurements almost always come with dirt smudges on them. During this visit I’m checking the light conditions, screening and privacy issues with neighbors, drainage concerns, soil condition, elevations… I also like to look for things that make the space unique. Is there an existing piece of art that needs to be worked in and can act as a focal point? Perhaps it’s obvious the client likes turquoise because of an existing bird feeder and grouping of containers. 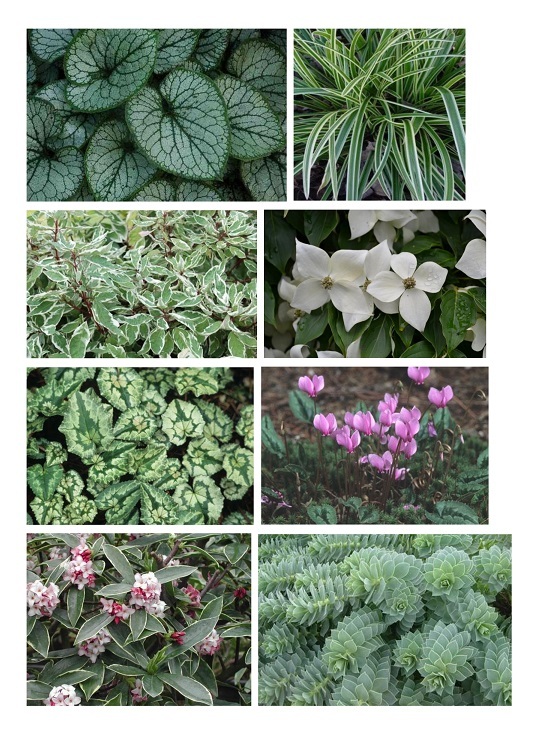 These types of clues can help dictate the future plant palette. Then it’s home for the basemap. This step takes longer than you’d expect. It’s important to get this stage right, as this is the map I’ll be using for all future designs of the space. A simple miscalculation can mean the difference between needing 2 steps and 4 steps… a big difference in price. Next, is when I start to do my research. It can be flipping through magazines and pulling out tearsheets that show examples of a space that has elements that will fit the space. Maybe it’s just a color that strikes a chord. I love to use Pinterest as a way to gather visuals and share them with the client. They can add their own images or thoughts to the board. It’s a fun way to collaborate and make sure we’re on the same page before I put pencil to paper. Here’s the Pinterest board put together for this project. It includes notes on what I like in each image. 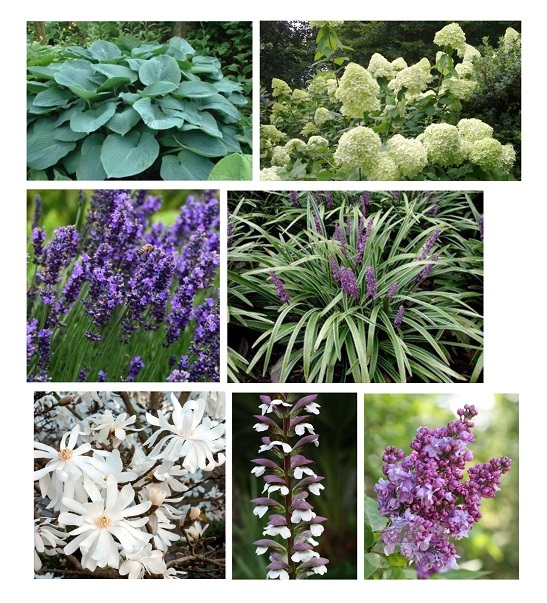 I also like to put together a sample plant palette to give the client an idea about the types of plants I plan to use. The palette highlights colors, textures and shapes. Here’s an examples from this project. the client wanted calming, muted colors. Lots of white and shades of purple to go with the gray exterior of their home. 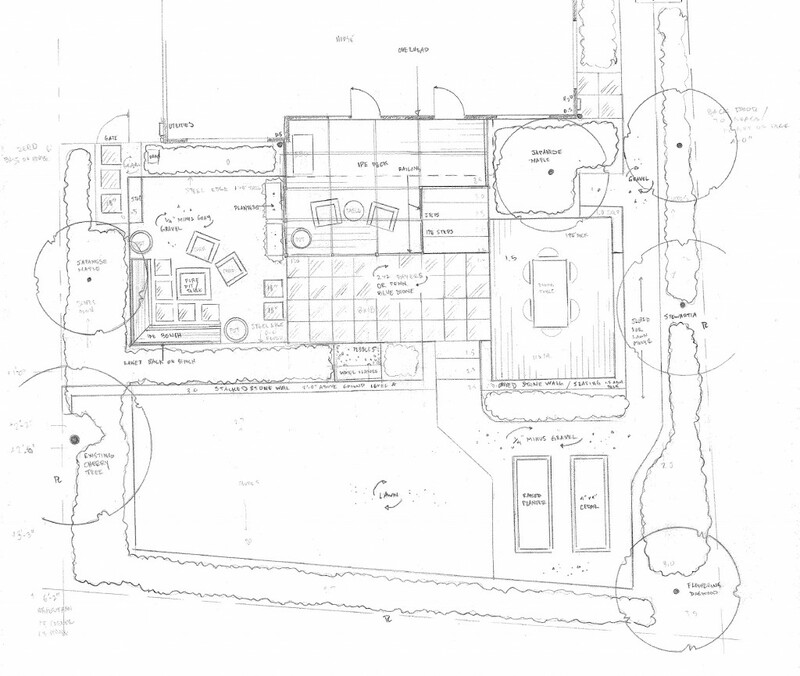 Concept 1: A single large deck with 2 distinct spaces, one for entertaining with built-in benches and a portable fire bowl, the other for dining. The steps lead to the upper lawn and vegetable garden. 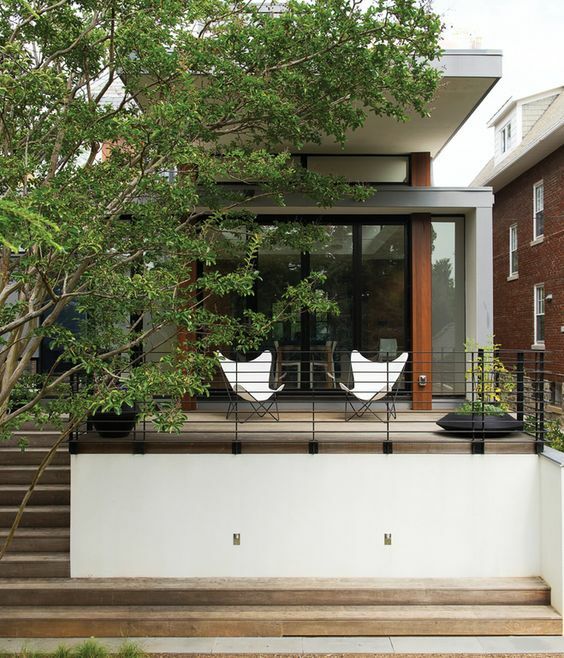 Concept 2: A covered deck that pops out off the kitchen with seating for two. A lower gravel fire pit with built-in benches. A raised deck with a stone retaining wall / bench surrounding it. Steps that lead to lawn and a vegetable garden. Then it’s concept meeting time! We discuss both versions, the pros and cons and general pricing. This is when we discuss how elements can be mixed and matched and materials changed. I then put together a final design that heads off to the contractor for bidding! Once the bid is accepted, it’s install time! I love the contractors I work with. All of them are total pros. I’m there through the process and we discuss and share ideas, next steps, etc… There are few things as rewarding as seeing a landscape come together. One of the final steps is plant placement. That’s when I get to run around and physically place each plant in it’s new home. To be cliche, it’s like putting the icing on the cake – the garden literally comes alive. And then, the garden gets turned back to you, no more machines, no more mess, just you and your new space. This design is in the final stage and is due to be install this summer! Stay tuned for during and after photos.